People say that being genuine is rare. One morning, my co-worker seemed a little down. I looked him in the eyes and asked honestly, “How are you doing?” That morning greeting led to lunch, then to dinner and, finally, to me interacting with him and his family. I felt way out of my league and unprepared. My co-worker and his wife were having their third child. I wasn’t even married (though I was newly engaged). I understand now why Paul would write to Timothy, “Don’t let anyone look down on you because of your age” (1 Timothy 4:12). I suspect this is not just how other people saw Timothy but how Timothy may have seen himself while he was leading other people in his early ministry. But from that point on, our conversations at work changed, and these conversations led to a couple other guys from work joining us in discussing life, family and balance. Though there were many times I didn’t have much to offer in terms of life experience, I soon learned that because we can cast our cares on the Lord (1 Peter 5:7), we can carry the burdens of others in small ways, even as they learn how to cast their cares on God themselves. Sometimes in the workplace, we can find the balance of eternity depending on some very small moments. Toward the end of John 4, Jesus told the disciples to lift up their eyes and see that the harvest is ready for harvesting (John 4:35). This was a harvest of people that the woman from the well helped prepare when she went back into town and shared about her encounter with Jesus. She was telling people to come meet someone who could connect with you in the most intimate way. My encouragement is to take our eyes off “us” and do things as simple as sincerely asking, “How are you doing?” Prayerfully, even these simple gestures allow us to worship the Lord in spirit and truth – regardless of the response we get. Oftentimes, we don’t know what seed we have planted or watered. As believers, we can be sure and be thrilled that we are co-workers in God’s plan, in what He is building (1 Corinthians 3:7-9). It is the Lord who is faithful to finish the work (Philippians 1:6). We just need to take small steps toward being genuine. If you are interested in a book on urban-focused discipleship or advice on building genuine relationships in the context of urban ministry, Chris recommends Among Wolves: Disciple-Making in the City. 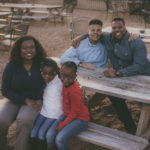 Chris serves dual roles: he is part of the Navigators’ AUC collegiate team and is the Pastoral Resident/College Experience Director with Blueprint Church, in Atlanta. If he is not building relationships with students, then he is spending time with his family or working on creative media projects. (For a sample of his work, check his YouTube channel: 3rd Row Media.) He proudly represents the great state of Oklahoma and enjoys Spanish lessons from his wife.